Objectives: To validate the physical and psychological effectiveness of cardiac pacing in pediatric patients with breath-holding spells (BHS) and prolonged asystole. Materials and Methods: The records and clinical data of all the patients with BHS who presented to our center in the period of 2001-2013 were reviewed. All patients who received cardiac pacemaker implantation for prolonged asystole during BHS were included. In addition, the parents were asked to fill out a standardized quality of life (QOL) questionnaire. Results: Seven patients were identified. The mean onset of symptoms was 7 month (1-12 months) of age, documented asystole was 12-21 seconds, and a permanent cardiac pacemaker device was implanted at a mean age of 23 months (8 months-3.9 years). No pacemaker related adverse events were recorded. Follow up showed immediate resolution from spells in four cases (4/7). Two patients (2/7) showed significant reduction of frequency and severity of spells, with complete elimination of loss of consciousness (LOC). One patient (1/7) with an additional neurologic disorder continued to have minor pallid BHS and eventually switched from pallid to cyanotic spells without further detection of bradycardia or asystole in holter examination. QOL questionnaire revealed significant reduction in subjective stress levels of patients (P = 0.012) and parents (P = 0.007) after pacemaker implantation. Conclusion: Cardiac pacing using appropriate pacemaker settings seems effective in the prevention of LOC and reduction of the frequency of BHS. Our results imply a reduction of subjective stress levels of patients and parents as well as an increased quality of everyday life. After all, randomized controlled trials of the influence of cardiac pacemaker implantation on subjective stress levels in patients with BHS are needed. Breath-holding spells (BHS), amongst other seizure-like episodes in childhood, are mostly harmless events in otherwise healthy pediatric populations. In contrast to these simple infrequent BHS, mostly without loss of consciousness (LOC), some patients suffer from a more severe form of BHS. The latter variant is characterized by very frequent spells and LOC. The estimated prevalence of these severe BHS is about 0.6-4%. Although the exact pathophysiology remains unknown, most authors differentiate between two basic mechanisms resulting in either pallid (pBHS) or cyanotic (cBHS) BHS. Both start with a provoking stimulus (pain, anger, or fright), resulting in emotional upset, which finally leads to a state of noiseless expiration. In pBHS, the asystole that follows is thought to result from exuberant vagally mediated cardiac inhibition [Figure 1]. cBHS result in a condition in which the child is finally unable to relax and inhale and thus becomes apneic and cyanotic. Both entities may lead to LOC and hypoxic seizures. ,,,,, Twenty-four-hour Holter monitoring and implantable loop recorders allow an effective distinction between both mechanisms. ,,,, Experiencing pBHS is often dramatic and terrifying for both patient and parents or siblings. A peak frequency of several episodes per day represents a major stress factor for affected families. Although both pBHS and cBHS are self-limiting conditions and there is no death reported in the current literature, there are no data available concerning the effect of frequent BHS with LOC on long-term neurologic outcome in affected individuals. Single- as well as dual-chamber cardiac pacing was reported to be effective in patients with BHS and asystole by Stephenson et al. (1999) and Di Pino et al. (2007). , Nonetheless, there continues to be some controversy about this treatment option since the implantation of a cardiac pacemaker (PM) in a child is an invasive method involving several risks. Consequently, this study aims to discuss and evaluate the assets and drawbacks of cardiac pacing in pediatric patients with prolonged asystole during BHS. Clinical data of patients who were presented to the Department for Pediatric Cardiology, Heart Center Leipzig in 2001-2013 with BHS were collected retrospectively. Patients who fulfilled our center's internal criteria for PM implantation, i.e., symptomatic patients with BHS and prolonged asystole, defined as multiple (>3) detected episodes of asystole lasting more than 10 seconds each, were included. Symptoms, onset of spells, age at first consultation, as well as surgical records and clinical follow-up data were reviewed. Long-term follow-up data were obtained from patient records and correspondence with parents. Written consent was obtained from all parents. Quality of life (QOL) questionnaire: A standardized questionnaire on QOL, stress levels of parents and patients (as reckoned by the parents), before and after PM implantation, was compiled by all parents of the children included in this study. The initial questionnaire was completed one day before PM implantation. The second questionnaire was completed at least three months after PM implantation. Data analysis was performed using SIGMAPLOT Systat Inc. Software. Patients were compared using paired Student t-test. A P-value of <0.05 was considered statistically significant. Seven patients who demonstrated BHS with LOC, documented prolonged asystole and received PM implantation were identified in three girls and four boys [Table 1]. The mean onset of symptoms was 7 months. The mean age at first consultation was 20 months (8 months-2.8 years). Clinical presentation was pallor in three patients and mixed-type spells with both pallor and cyanosis in four patients. All patients were referred to our department after clinical evaluation elsewhere, which included at the least EEG and ECG. Apart from suffering from BHS, six children were otherwise healthy. One patient had undergone surgical treatment due to coarctation of the aorta shortly after birth, as well as internal ventriculoperitoneal shunts insertion for hydrocephalus after surgical treatment of a spinal myelomeningocele (patient 7). Before PM implantation, all patients suffered from frequent LOC during episodes of BHS. Mean frequency of symptomatic spells including LOC was 1.4 per day with up to 5 episodes per day in the most severe case. This patient was also resuscitated once after suffering LOC due to BHS during hospitalization (patient 7). One patient showed symptoms rather infrequently, usually when experiencing sudden pain, and suffered minor head injury when collapsing once (patient 6). After admission, a physical examination, 12-lead ECG, echocardiography and Holter recording were performed. No signs of structural heart defects were observed. Asystole was detected by Holter recording in six cases; in one case, a Medtronic REVEAL implantable loop recorder had already been implanted at another hospital. ECG data showed tachycardia at the beginning of the spell, followed by bradycardia and temporary asystole. No other signs of cardiac arrhythmia, i.e., AV block, prolonged QT duration, or pre-excitation were observed. PM implantation followed 1 week-13 months after first consultation. Mean age at implantation was 23 months (8 months-3.9 years). 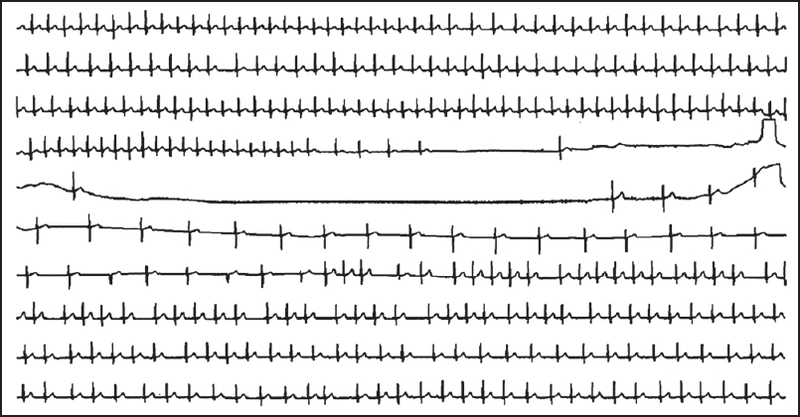 Six patients received epicardial-pacing leads using a subxiphoid approach. In one case transvenous PM implantation was performed. All patients had VVI pacing with 100-110 beats per minute (BPM) and search hysteresis of 40-50 BPM to allow for spontaneous rhythm in between the asystole episodes. All patients were followed up every 6 months for a mean period of 4.06 years (range, 7 months-7.7 years). No PM related adverse events were recorded. 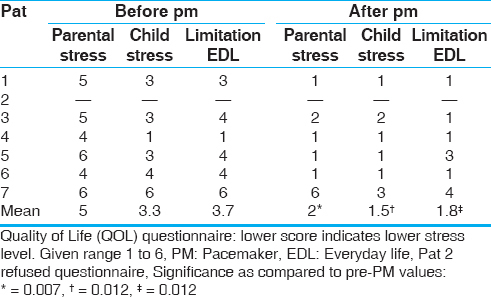 [Table 2] summarizes the subjective stress levels of patients and parents before and after PM implantation, as well as the influence of the spells on everyday life as reported by the patients' parents. Paired t-testing showed a significant reduction in parental stress (mean 3.0, CI 1.24-4.76, P = 0.007, test power 0.92), patients stress levels (mean 1.83, CI 0.61-3.06, P = 0.012, test power 0.85), as well as improvement in everyday QOL (mean 1.83, CI 0.61-3.06, P = 0.012, test power 0.85). There is an ongoing controversy regarding the indication for cardiac PM implantation as a treatment option in patients with BHS. While BHS is generally considered a self-limiting disease with a reported mortality rate of 0%, it is often a dramatic and terrifying experience, putting patients and families under severe psychological strain. In addition, until now, no data were collected on the long-term effect of frequent (>3) episodes per week of BHS with presyncope or syncope on the neurodevelopmental outcome in these patients. As LOC and associated seizures are believed to arise from hypoxia caused by cerebral hypoperfusion, it seems a logical conclusion that repeated episodes of symptomatic cerebral hypoperfusion are not beneficial for the affected patient. Reviewing literature on current BHS treatment strategies, it becomes apparent that some confusion arises from the varying definitions of BHS, where some definitions focus on clinical aspects, other focus on the pathophysiology, and only few definitions respect LOC or seizures. ,,, Nevertheless, it is beyond dispute that mild courses of BHS without LOC or very infrequent episodes do not need treatment because the disease is benign and the condition itself will mostly resolve by the age of five years. Apart from these benign causes of BHS, the treatment of those patients with very frequent spells including frequent LOC remains challenging. This study focuses on patients with BHS with LOC and documented prolonged asystole with regard to the effect of PM implantation on patients' symptoms and patient/parental QOL. To the best our knowledge, this study presents the first data on QOL before and after PM implantation in this group of patients. Concerning psychological stress experienced by the affected families, Mattie-Luksic et al. (2000) showed that mothers of children with BHS experienced more overall stress and disruption in their attachment or understanding of their child and showed significant more disruption in their sense of competence as a parent compared to mothers of children without seizure disorders. Similarly, our results showed a marked decrease in patient as well as parental stress. In addition, a decrease in limitations of everyday life after successful elimination of BHS-related symptoms can be seen from the data. Parents reported their own stress level to be higher than that of their children. Apart from reducing parental stress, permanent PMs are reported to effectively protect patients from further LOC and reduce near-miss events during BHS with asystole. As reported by McLeod et al. (1999) who compared placebo versus VVI vs. DDD pacing in 12 children with BHS and asystole with LOC, both dual-chamber and single-chamber pacing significantly reduced the number of syncopal episodes compared with placebo. VVI was as effective as DDD for preventing syncope, but DDD was superior to VVI in reducing near-miss events. Included were patients with asystole duration of 10-40 seconds. DiPino et al. (2006) reported immediate resolution of spells in one patient with BHS and asystole of 26 seconds after PM implantation. The same was reported by Kanjwal et al. (2009) in another patient with BHS and asystole of >20 seconds. Kelly et al. (2001) reported their experiences with 10 patients. They found an immediate resolution of spells in five and prevention from LOC in two patients. Three nonresponders were reported, all of them with either only severe bradycardia or relatively short asystole of maximum 6.8 seconds. Our results underline the effectiveness of cardiac pacing in patients with BHS and prolonged asystole. Looking at those patients who did not respond immediately to therapy, two basic mechanisms seem to be involved. Firstly, a critical duration of asystole is needed to be the only major cause of the LOC and thereby can be effectively prevented by cardiac pacing. Secondly, correct PM settings are needed to prevent symptoms. Cardiac PM settings should be chosen to provide stimulation only in case of asystole and avoid excessive ventricular stimulation. In addition, cardiac PM not only has to compensate for the asystole but also provide enough cardiac output to balance out the effect of lowered blood pressure by vagally mediated vasodilation, which is also present to various extents during BHS. Following the experience in our center, the most appropriate setting is VVI pacing at 100-110 BPM and a repetitive hysteresis of about 40-50 BPM depending on the patient's age [Figure 2]. As shown in the presented data, these settings effectively prevented episodes of LOC in 6 out of 7 patients and significantly limited the number of spells that were associated with LOC. As mentioned above, there was one nonresponder in our group. This patient (number 7) suffered from ongoing spells including seizures and LOC despite PM implantation and optimization of PM settings. In this patient the spells switched from BHS with asystole to cyanotic spells. We speculate that the associated central nervous system disorder may have an additional influence on the clinical picture. As PM therapy currently remains an elective procedure in the treatment of BHS, complication rates need to be considered. The rate of device revisions is reported to range up to 40% (4/10 patients). ,, The causes were lead dislodgement or device infection. Endocardial leads were affected in the majority. In our group, no PM-related complication appeared. All but one patient were treated with an epicardial device by a trained cardiac surgeon via a subxiphoid approach. This access provided excellent PM function and good cosmetic results and left central venous routes unaffected. Firstly, this is a retrospective chart review study. Secondly, the presented data is the result of a single center study, which may be biased due to surgical technique and internal processes. Thirdly, QOL questionnaires were obtained in retrospect, i.e., after PM implantation. Cardiac pacing using appropriate PM settings appears to be effective in the prevention of LOC and reduction of the frequency of BHS. Our results imply a reduction of subjective stress levels of patients and parents as well as an increased quality of everyday life. After all, randomized-controlled trials of the influence of cardiac PM implantation on subjective stress levels in patients with BHS are needed. The authors thank Mrs Bettina Müller for linguistic support and Mrs. Jacqueline Richter for overall support. Benbadis S. The differential diagnosis of epilepsy: A critical review. Epilepsy Behav 2009;15:15-21. Breningstall GN. Breath-holding spells. Pediatr Neurol 1996;14:91-7. DiMario FJ Jr, Chee CM, Berman PH. Pallid breath-holding spells. Evaluation of the autonomic nervous system. Clin Pediatr (Phila) 1990;29:17-24. Al Dhahri KN, Potts JE, Chiu CC, Hamilton RM, Sanatani S. Are implantable loop recorders useful in detecting arrhythmias in children with unexplained syncope? Pacing Clin Electrophysiol 2009;32:1422-7. Mattie-Luksic M, Javornisky G, DiMario FJ. Assessment of stress in mothers of children with severe breath-holding spells. Pediatrics 2000;106:1-5.